The information below will help you to learn more about your student’s participation in the UBC Arts Co-op Program, whether he/she has already been admitted to the program or is considering applying. For more information on any aspect of the Arts Co-op Program, please contact our office at (604) 822-1529 or email arts.co-op@ubc.ca. Please note that because of University policies, we cannot discuss specific students’ engagement with our Program with you or anyone else, without their written permission. What is the Arts Co-op Program? The Faculty of Arts Co-operative Education Program at UBC is a competitive experiential learning program. It's 1 of 6 co-op programs at UBC and is accredited by both the Canadian Association for Co-operative Education and the UBC Senate. What is co-operative education (co-op)? Co-operative education allows students to explore a range of careers during 4 or 8-month paid work terms. Employers across Canada and around the world hire Arts Co-op students in non-profit, private business, and government positions. What are the benefits to participating in the Arts Co-op Program? How much does it cost to participate in co-op and how much would a student earn? When students are accepted into the program, they are required to pay a one-time co-op advising fee of $247, which includes access to 3 mandatory pre-employment training conferences and ongoing job search and career advising appointments. For each co-op work term secured, a student also pays tuition of $759.75. On average, an Arts Co-op student earns $27,000 over 3 work terms. The total co-op fees the student pays over these 3 terms is $2,477.25 ($247 advising fee + $2,279.25 tuition fees). The resulting return on investment for a student participating in 3 co-op terms is $24,473.75 – a significant contribution to financing a student’s university education. What is a co-op work term? A co-op work term is 13-16 weeks full-time, paid work (approved by Co-op Office). During each work term, students develop professional goals, complete projects evaluated by co-op staff, and receive a midpoint check in from their assigned co-op coordinator (in person or by phone). Students and employers complete evaluations at the end of term. Students receive a Pass or Fail grade on their transcript for each work term. How many co-op work terms does a student have to complete? A student must complete a minimum of 3, and a maximum of 6, co-op terms before graduation. 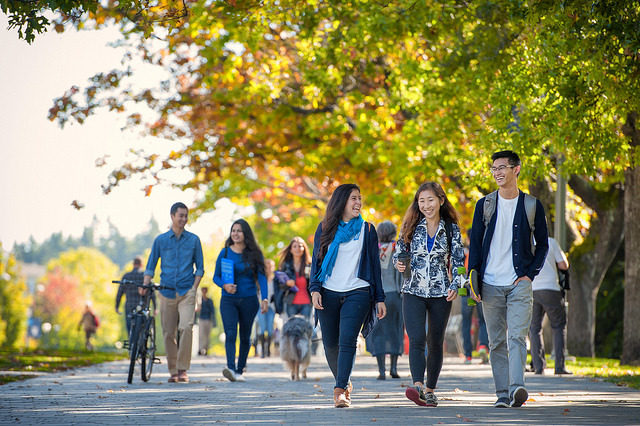 Students who successfully complete the program requirements graduate with the co-op designation on their transcript and parchment in addition to their academic major, as agreed upon by the UBC Senate. How much longer does it take a co-op student to graduate? Participation in co-op usually adds 6-12 months to complete a full-time degree. How do students apply to co-op jobs? Students access co-op job postings through a password-protected website for Arts Co-op students only. They apply for jobs, employers decide who they want to interview and hire, and the co-op staff facilitate the process. What support do co-op staff provide students? The Arts Co-op staff provide extensive, specialized training for co-op students through 3 pre-employment conferences, and ongoing, one-on-one coaching on job applications, interview strategies, and long-term career planning. When on a work term, every student is assigned a co-op coordinator who is available for the student to contact if any questions or problems arise. What do employers expect from students during a work term? During work terms, students are regular employees and therefore must fulfill their professional obligations as they would any other job. Students are expected to take their responsibilities seriously and to place a high priority on their commitment to employer. This means they may need to rearrange family holidays and other personal commitments during the work term. Students who do not fulfill their responsibilities to the employer’s satisfaction and/or who behave unprofessionally will receive a Fail on their co-op term and be removed from the Program. Do students need to relocate? About 30% of our job postings require students to move to a different city or country. Many types of work (e.g. government positions) require students to move as they are not available locally. Students willing to relocate have greater opportunities of building career experience and professional contacts. If personal circumstances make relocation impossible, the student should inform the Co-op Office in advance of applying for a work term and not apply to jobs outside of town. Students who decline job offers in line with their academic and career goals because of unwillingness to relocate will not be allowed to continue in the Program. What support does the Program provide students who need to relocate? Moving away from family and friends to explore a new city, establishing and managing their own living arrangements, and perhaps learning about a new culture or country can be extremely rewarding. The Co-op Office and senior co-op students with experience in the new area offer support and advice to students as they transition into their new living and working environment. Students undertaking international co-op terms must complete online workshops and register their placement details with the UBC Safety Abroad program to ensure they are properly prepared and supported during their term.